How Long Do You Think Golf Cart Batteries Can Last? Home GOLF CART BATTERY TIPS How Long Do You Think Golf Cart Batteries Can Last? Golf cart batteries are very reliable power cells that are designed to be deeply discharged or used for longer operations. They are the ones that power the workhorse of golf clubs and they are also the ones that allow the golf carts to make life easier for the golfers. Keeping them in top shape is a priority to ensure excellent performance and great overall experience. These batteries needed to be well-maintained and handled properly to make sure that they are in excellent condition. If golf cart batteries are well-maintained and in good condition, they will last longer and provide excellent performance. Their runtime will also be greatly affected and allow them to be used for longer operations and reduce downtime. Most battery packs in a golf course cart fleet are used more compared to power cell packs of private owners. 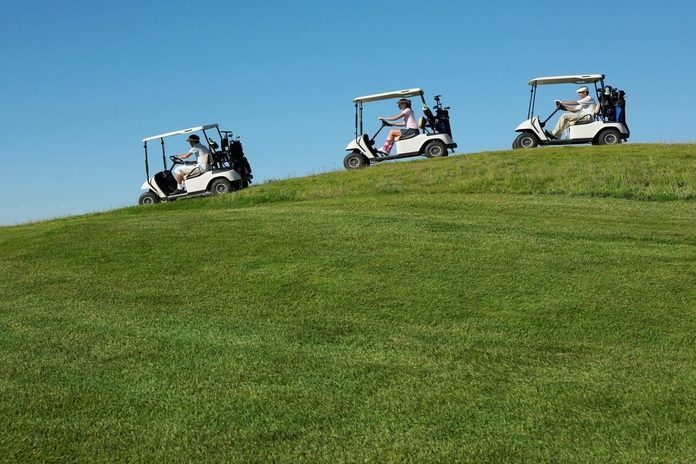 Normally golf carts are used for at least two to three rounds of golf every day, while private carts are used three to five rounds of golf. That means, in normal situations a single fully charged battery pack will last up to six or more rounds of golf and any higher than that will deeply discharge the batteries which will be dangerous. So make sure that the batteries will not be overused or too deeply discharged. Typically golf cart power cells have a life expectancy that ranges from four to six years. But if they are well maintained and well taken care of, they can last up to six to ten years. So if you take well good care of your golf cart power cells, they will have a longer service life that will allow you to get the most out of them. If you want to learn how to take good care of your golf cart power cells and extend their life, make sure to keep these tips in mind. Extending the lifespan of your golf cart batteries is a matter of giving them the proper maintenance they need as well as charging them properly. To help you extend the service life of your golf cart batteries, here are some tips and good practices that you have to keep in mind. When you are trying to maintain a deep cycle battery, you always have to make sure that you charge it after every use and make sure that they are fully charged before use. Using it not fully charged will risk it to suffer from sulfation. We all know that sulfation is considered to be the number one cause of death to batteries. By keeping this particular tip in mind will help you make sure that your batteries will have a longer service life. To make sure that you will extend the service life of your batteries, make sure fully charge them between uses. One of the good practices in maintaining ​your golf cart batteries are always to monitor their water levels. Older batteries tend to use more water and then the higher the temperature, the faster the batteries discharge. Make sure that the water level of the batteries will not fall below their plates to keep them in good condition and allow them to provide optimum performance. Keep in mind to never let the electrolytes of your batteries will not fall below their battery plates. Keeping your golf cart batteries well-maintained and clean will also ensure excellent condition and great performance. It will also help you extend their service life that will allow you to get the most out of your batteries. Checking up your battery on a regular basis will also keep you updated with regards to its condition. Letting you know if they are damaged, if they need reconditioning or if they need to be replaced. You can do the checkup every time you will charge your battery after using your golf cart. Another good practice that you have to keep in mind is to check the water levels of the batteries after every charging session. Charging may cause the water within the batteries to evaporate that will cause your electrolyte levels to be below the plates. This will limit the performance of the batteries and will eventually lead to their demise. So, you have to make sure that you check the water levels of the batteries after charging them. Rough drives and bumpy rides may cause a lot of physical damages to your batteries that will eventually lead to their death. So make sure to avoid rough rides and bumpy drives at all cost. This will minimize the wear and tear of the batteries and will also help you extend their life. In this article, you learned a lot of valuable information regarding your golf cart batteries through Battery Man Guide. It provided you information like how long do golf cart batteries last​ and some tips that will help you prolong their lifespan. To make sure that you extend the service life of your golf cart batteries keeps these tips in mind.